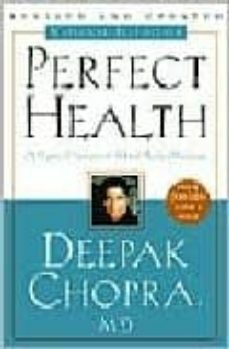 A decade ago, Deepak Chopra, M.D., wrote Perfect Health, the first practical guide to harnessing the healing power of the mind, which became a national bestseller. The book described how breakthroughs in physics and medicine were underscoring the validity of a 5,000-year-old medical system from ancient India known as Ayurveda ("the knowledge of life span" in Sanskrit). Perfect Health went on to describe how to apply the ancient wisdom of Ayurveda to everyday life. In celebration of this classic work we have created this new edition, revised and updated to include the latest medical research. Although we experience our bodies as solid, they are in fact more like fires that are constantly being consumed and renewed. We grow new stomach linings every five days, for instance. Our skin is new every five weeks. Each year, fully 98 percent of the total number of atoms in our bodies is replaced. Ayurveda gives us the tools to intervene at this quantum level, where we are being created anew each day. Ayurveda tells us that freedom from sickness depends on contacting our own awareness, bringing it into balance, and then extending that balance to the body. Perfect Health provides a complete step-by-step program of mind body medicine tailored to individual needs. A quiz identifies the reader's mind body type: thin, restless Vata; enterprising, efficient Pitta; tranquil, steady Kapha; or any combination of these three. This body type becomes the basis for a specific Ayurvedic program of diet, stress reduction, neuromuscular integration, exercise, and daily routines. The result is a total plan, tailor-made for each individual, to reestablish thebody's essential balance with nature; to strengthen the mind body connection; and to use the power of quantum healing to transcend the ordinary limitations of disease and aging—in short, for achieving Perfect Health.